In a world increasingly filled with portable electronics, batteries are gradually becoming an even bigger part of our lives. From cell phones to laptops to video game controllers, different types of batteries are everywhere, often containing specific types of chemicals that require a unique method of disposal. The chemicals found in batteries can be hazardous to the environment if not disposed of properly. If sent to a landfill, some batteries may emit harmful gases into the air when incinerated, while others, like household rechargeable batteries containing nickel-cadmium, can contaminate water supplies once battery casings erode. Charged lithium batteries even run the risk of starting a landfill fire if simply thrown away. Although batteries pose a dangerous threat to the environment, steps have been taken in the last couple of decades to curb the trends of improper battery disposal. In 1996, Congress passed a “Battery Management Act” that required companies to make batteries easily removable from products and provide consumers with information about how to dispose of certain types of batteries. It also banned the use of mercury in household batteries, which had been a major concern of environmentalists up to that point. Since then, California has required that almost all batteries be recycled, while the Rechargeable Battery Recycling Corporation has formed a centralized recycling program with centers all over the U.S. that can now accept rechargeable batteries, named Call2Recycle. While these advances represent steps in the right direction, consumers also bear the responsibility of proper battery disposal. Commonplace, non-rechargeable household batteries can simply be thrown out in most states, however, rechargeable batteries and lithium batteries found in laptops and cell phones must be recycled. Consumers can locate recycling centers on websites like Call2Recycle and e-Cycle Environmental, while new cell phones often come packaged with convenient recyclable mailers for phones and batteries. In addition, lead-acid batteries used in cars can be disposed of through hazardous waste programs funded statewide and locally. 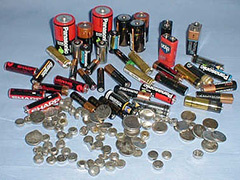 Consumers should also try to prevent battery waste by 1) always checking beforehand to see if they might already own batteries before purchasing more, 2) if possible, avoid products that require batteries, and 3) use rechargeable batteries that will not have to be discarded often, but be mindful that these batteries contain heavy metals that must be recycled. If consumers and companies work together to ensure safe disposal of battery products, technology and nature can move one small step closer to existing together harmoniously. Posted on January 10th under Pollution Reduction.